From the airport, we drove straight to Aix-en-Provence – a charming city filled with the fading grandeur that characterises so much of southern Europe. We headed for Place des Cardeurs: a square filled with wobbly tables and sun umbrellas blown by the mistral wind, sprawling inwards from a plethora of cafes. We chose the eponymous Café des Cardeurs for the inaugural meal of the holiday, where the first thing I ordered was a glass of dry Provençale rosé. I am rarely dissatisfied by salads in France, and this typical combo of chèvre (French goat’s cheese) magret de canard (cured duck breast) and figs was no exception. The dressing was a little sweet, but the rest was spot on. 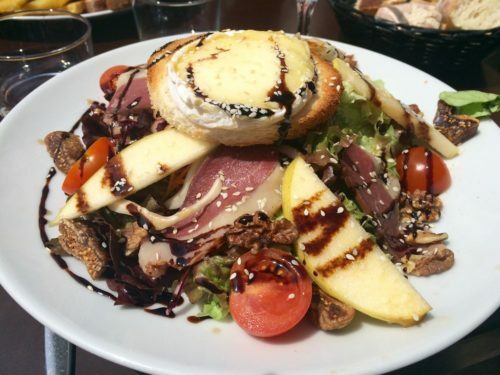 Cafe des Cardeurs: French salads are always a pleasure! After lunch, our wanderings took us past an ice cream parlour called Edouard et Maelle that my brother confidently assured me also serves the best crêpes in Aix. That seemed like too good an opportunity to pass up, so my niece ordered a chocolate crêpe while the grow-ups had the crêpe sucrée. Freshly made and piping hot, dessert did not disappoint. No restaurants on the second day of my trip, but instead a visit to a local market. 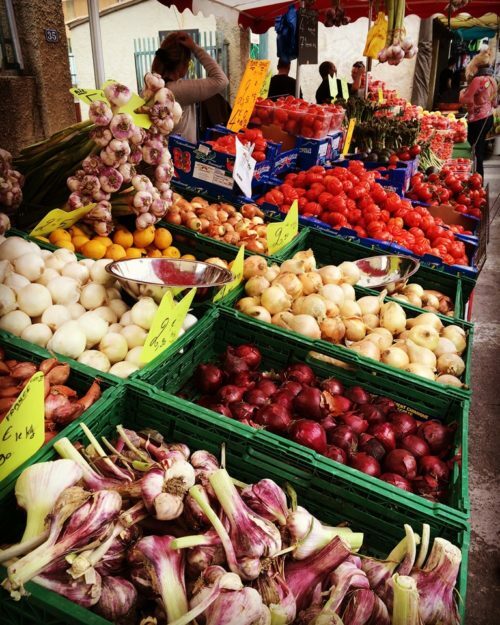 Each village in the area holds its market on a different day of the week, which means that even if you’ve missed the market in the village you’re staying in (which we had – Lambesc market is on Fridays), you don’t have to drive very far to reach a market that’s open. My day 2 being a Sunday, we drove to the next-door village of Pélissanne to stock up on saucisson, tortons (imagine mini French empanadas – very moreish), meat for the BBQ, local olive tapenade, cheeses, and of course fresh veges. I spent a fortune, but I had a lot of fun practising my A-level French while the market stallholders relieved me of my cash! After a morning’s freelancing (my brother is Amsterdam Foodie’s Technical Director, by the way – i.e. he programs the backend of the website), we were hungry for some more French fare. This time, I ordered a classic steak tartare from Café de la Poste in Mallemort. 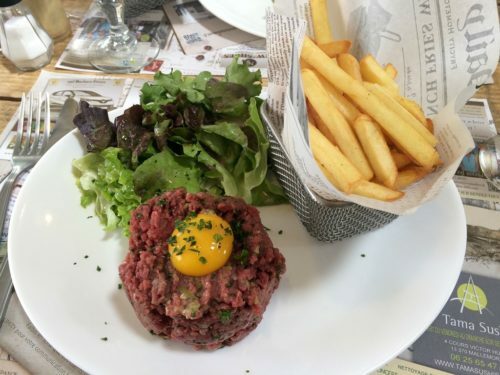 There’s nothing especially Provençale about steak tartare, but I love the fact that in France it’s a simple, unfussy lunch dish, served with chips and salad. Whenever I order steak tartare in Amsterdam, it’s half the size, twice the price and comes dressed up with all sorts of unnecessary cheffy touches designed to make it look more complicated than it really is. 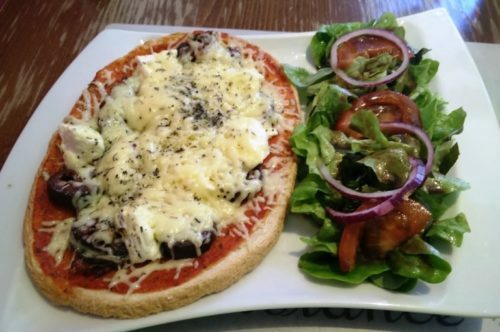 This version was a straightforward, no-frills lunch staple. 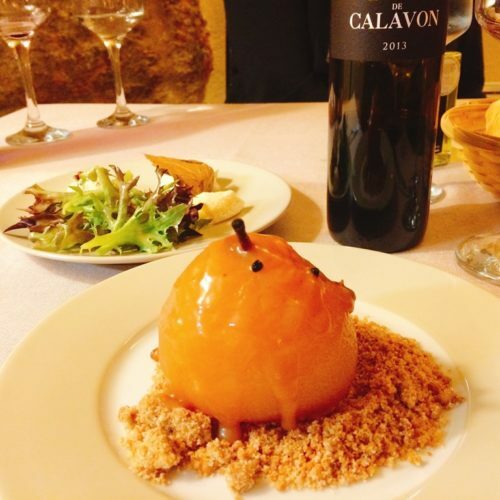 Undoubtedly our most high-end meal of the trip, but still very affordable compared to Amsterdam restaurants, we’d been tipped off about Au Moulin Gourmand in Cadenet by a restaurateur in a nearby village. The menu dégustation was a very reasonable €30 for three courses (and there was even a cheaper version at €23 for three courses) so it seemed rude not to indulge. Our first course was a tartare of dorade and langoustine, whose richness had been freshened up with pomegranate seeds and lemon zest. The main course was a veritable celebration of the season: lamb cooked two ways. One was a simple chop; the other was so-called “seven-hour lamb” – slowly cooked shoulder of lamb that had reduced down to a rich, unctuous confit. It was offset by late-winter vegetables like celeriac, turnip and beetroot. The weather was surprisingly cool and damp for most of the week, so it was a perfect dish for a chilly evening. For dessert, I tried a trio of regional goat’s cheeses, while my brother had a pear poached in Sichuan peppers, stuffed with ice cream, and served with a speculaas crumble. Even with a bottle of wine, we didn’t break €80 for two, and it was one of the better meals I’ve had in a while. We’d originally driven over the mountains to La Roque d’Antheron in search of the famous figatelli served at Chez Caesar: imagine a French version of black pudding, which in this case has been turned into a sort of giant bruschetta. My brother assures me that it’s marvellous (and he would know), but alas it wasn’t to be: Chez Caesar was closed for some unexpected emergency and wouldn’t re-open until after I’d left Provence. Instead, we headed next door to L’Auberge du Castellas: a cosy, bare-brick restaurant run by a rather eccentric maître d’ and his chef-wife. They were busy the lunchtime we were there (perhaps because of the unexpected closure of their neighbouring restaurant) so the service was a little slow. My brother and I had maxed out on meat at this point, so we both decided to go for the only vege option (the plat du jour was andouillette, incidentally, which is pretty adventurous even for the foodiest of carnivores). But here comes the inevitable note to self: don’t even bother with vegetarian food in rural France. The waiter couldn’t hide his incredulity that we weren’t ordering meat, which was probably fair enough given that we then paid €20 for what was essentially a plate of buttered vegetables and some quinoa. Next time, I should probably just take on the andouillette. My brother’s flight left a few hours before mine, so I headed into the centre of Marseille for the day before flying home to Amsterdam in the evening. 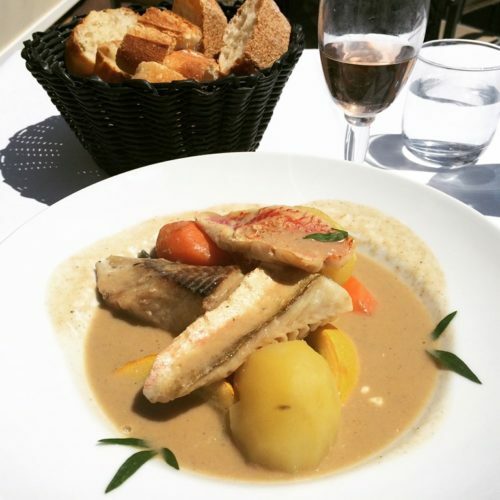 I was determined to eat bouillabaisse while I was there, and had diligently done my research about the best restaurants to eat bouillabaisse in Marseille. My findings led me to Chez Madie Les Galinettes, on the harbour front but less touristy than many of its neighbours. I sat at a table outside (it was finally sunny) and was dismayed to see that the bouillabaisse cost €45 and was clearly designed for two people sharing. Breaking out my A-level French once again, I explained my predicament to the waiter, who suggested I try the Bourride de Méditerranée (another regional speciality, apparently) instead. I took his advice and was pleased I did: while it may not have been quite the bouillabaisse I was looking for, it was a quintessentially fishy soup, with a garlicky rouille – both perfectly engineered to be mopped up with hunks of baguette. It came with pieces of red mullet, other white fish from the Mediterranean (I forget which) and various squash, green beans and carrots. My bourride, coupled with a glass of rosé and a sunny view, was the perfect end to my week in Provence.